Looking to coordinate your St. Patrick's Day event with a splash of appropriate color? 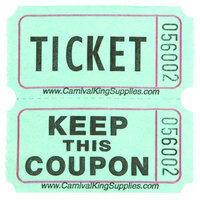 Green raffle tickets will suit your occasion. Their small size makes them perfect to hand out during prize drawings and 50/50 raffles, and their bold black letting and numbering makes them easy to read. 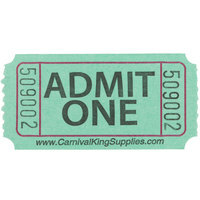 Green admit one tickets are a great way to track the amount of attendees and spectators at your carnival, concert, party, or sporting event. 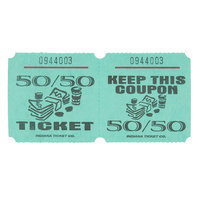 Green raffle tickets are the ideal item to keep your 50/50 raffle or prize drawing running smoothly. They have easy-to-read labeling and perforated edges that allow for effortless tearing. Green admit one tickets come packaged in large rolls, so you won't have to worry about running out of tickets during your St. Patrick's Day celebration or other event. For more special event and party supplies, check out our straws and stirrers, coat check tickets, and pull tab games of chance. If you're wondering where to buy green raffle tickets, we have a large selection of green raffle tickets for sale at the lowest prices.